Is that not the message of Easter? The role of suffering in a Christian’s life is illustrated so painfully yet beautifully throughout Holy Week. Good Friday is an integral part of God’s plan because without the pain of Good Friday, we wouldn’t have the power, the miracle, the JOY of the resurrection. Christ chose to put aside His divinity to fulfill God’s salvation plan. We, too, have to choose to die to self before we can truly experience the resurrected life Christ has planned for us. But when you do, that experience can move the most reserved to a resounding rendition of the Hallelujah chorus. Easter Sunday is all about renewal and hope. Not the wishful thinking kind of hope, but one of confident expectation of something promised, such as Christ’s promise in Revelation 21:4: “He will wipe every tear from their eyes. There will be no more death or mourning or crying or pain, for the old order of things has passed away.” Don’t be discouraged by the trials you’re facing today. As I mentioned, without pain, you can NEVER experience the JOY of your own resurrection as you pass through suffering. It is usually in our darkest hour where God’s miracles and blessings occur. As Christians, we can rest in the joy of knowing that we will be given the power to rise from whatever ashes life creates in our lives. As it says in Philippians 4:16, “That is why we are not discouraged. Though outwardly we are wearing out, inwardly we are renewed day by day.” Jesus makes all things NEW. He tells us so in Revelation 21:5, ‘I am making everything new!” This truth isn’t a future promise but one we can claim right now. Jesus didn’t say He will make things new, He says He IS making things new. That’s the beauty and miracle of Easter. Webster defines a fool as a person who acts unwisely or imprudently. Believing in the Easter Bunny is foolish; believing that Christ suffered, died and rose again to reconcile us with God is not. Because if He didn’t, what exactly are we celebrating today? Sending your children out to find chocolate eggs on Easter morning (without hiding any of course) and expecting them to come back with a treasure of goodies would be a cruel April Fool’s prank. 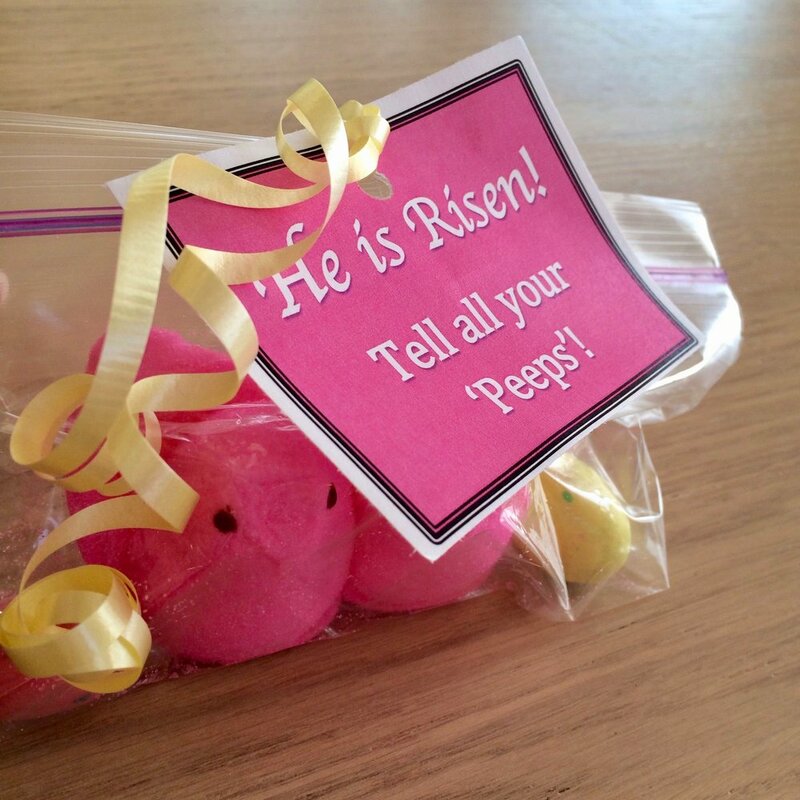 Sending them into the world with the wisdom to discover God working in the lives of others will reap a treasure so much sweeter than any Cadbury could create – even the cream-filled eggs my niece likes so muc. 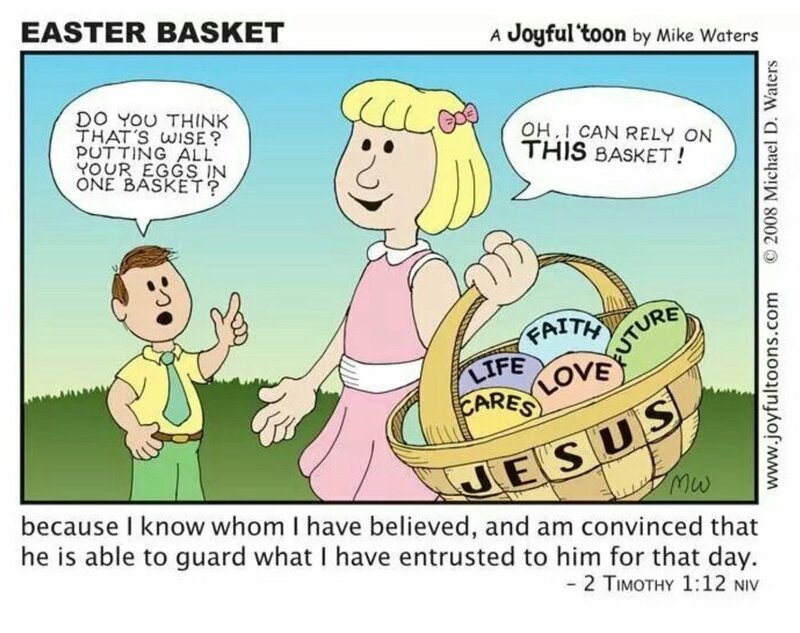 How do you choose to fill your Easter Basket? With worldly delicacies that offer only momentary pleasure, or with the promises of Christ that offer a joy that will last forever? Choose wisely.